Are you ready for Chai in the Hub on Saturday, February 3? We can't wait to announce our 10 amazing honorees and to tell you who our celebrity guest speaker will be. Keep an eye on your inbox to be the first to know and to get your tickets for the party of the year! Come to the biggest Hanukkah party in town! Join the Jewish Arts Collaborative, CJP, and many other organizations at the Museum of Fine Arts on Wednesday, December 13. We'll celebrate with music, storytelling, artmaking, a scavenger hunt, and more fun for all ages. There will also be a community menorah lighting at 6:30 p.m. Museum admission is free after 4:00 p.m., so there's no excuse not to join in the fun. We can't believe 2017 is already coming to an end. If you want to help CJP start 2018 in a position of strength (and really, why wouldn't you? ), make a year-end gift now – it's also your last chance to be eligible for a 2017 tax deduction. Looking to make a wider impact? Consider establishing a Donor Advised Fund to streamline all your charitable giving. You may know that CJP is currently searching for our next President and CEO. We regularly update the President Search page on cjp.org to keep you up to date on the progress being made by our President Search Committee. You will find everything you need to stay informed, including the Position and Candidate Specification and reflections from Co-chairs Shira Goodman and Aron Ain. If you have any questions or insight about the search, please send them to CJPpresidentsearch@cjp.org. Did you know that the individuals with a BRCA gene mutation are at increased risk of breast, ovarian, prostate, and other cancers? And that people of Ashkenazi Jewish ancestry are 10 times as likely to carry a BRCA mutation as the general population? Get tested! The BRCA Founder Outreach Study (BFOR) is offering BRCA testing at no cost. If you're 25 or older, have at least one Ashkenazi Jewish grandparent, and live in Boston, New York, LA, or Philadelphia, you're eligible. Learn more and sign up for the study. Do you work in the medical or healthcare field? Join us at the Royal Sonesta in Cambridge for a morning of networking and philanthropy at the Health Professions Annual Breakfast this Sunday, December 3 at 9:00 a.m. Our keynote speaker is Brigadier General Tarif Bader, M.D., M.H.A., M.A., Surgeon General of Israel Defense Forces, who will discuss "Humanitarian Aid." You’re also welcome to attend a pre-reception hosted by the Health Innovations Network at 8:00 a.m. Want more facetime? This year, you’re invited to a networking hour for Young Health Professionals (ages 22–45) after the Breakfast. Walk-ins welcome! CJP and the Consulate General of Israel to New England are proud to introduce Project Inspire, an opportunity for young adults to see Israel’s global ingenuity and entrepreneurship up close during a week-long journey to Nairobi, Kenya. Our pilot trip will run February 18–26, 2018, and we are now recruiting changemakers who want to have a meaningful impact in Boston and beyond. If that sounds like you, learn more and apply by December 11! Calling all neat freaks, fashionistas, and general do-gooders! Women’s Philanthropy is holding a sorting and donation party to benefit the Clothing Closet of Jewish Family Service of Metrowest on Thursday, January 18 – sign up today! Connect to Israel on your commute, and hear from everyone from Julian Edelman's "Israel guy" to Ambassador Dennis Ross on the israel360 podcast. These episodes and more are available on SoundCloud and iTunes, as well as on israel360's website. And don't forget—if you download the free israel360 Mobile app for iOS, you'll be entered to win a signed PJ Library edition of Julian Edelman's children's book, Flying High. It's a win-win! The first Jewgooders of 2018 is coming up, so save Thursday, February 22 for a night of friends and giving back. We'll let you know as soon as you can reserve your spot! On Sunday, December 3, 2017, join Limmud Boston, the annual celebration of Jewish culture and lifelong learning. The program runs all day at Temple Reyim in Newton—feel free to come for the whole thing or just for the sessions that interest you most! Topics include climate activism, storytelling, Mussar, and music. Learn more and register today! Present for your bubbe? Done and done. Make your own set of Hanukkah candles to last the eight nights with The MEM Project’s 6th annual Hanukkah candle-making workshop on Monday, December 4 at Temple Israel of Boston. Keep them for yourself or give them away for a unique holiday gift! No prior art experience is necessary, but registration is required! Missing the fun of the Boston Jewish Film Festival last month? Come to a screening of My Hero Brother on Sunday, December 10 presented by New England Yachad. This award-winning documentary tells the remarkable story of a group of young people with Down syndrome that embark on a demanding trek through the Indian Himalayas with their siblings. After the screening we will have a Q&A with the director, Yonaton Nir, via Skype. Get your tickets today. Join Havurah on the Hill for the Shabbat during Hanukkah on Friday, December 15! Their fun-filled evening will feature Honorable Menschen (Boston's premiere post-collegiate Jewish a cappella group), a latke bar, and a grown-up game night, featuring dreidel, Outburst, Cards Against Humanity, and more, so sign up now and don't miss your chance to be a part of the fun! Join ADL New England as they honor Diana Moskowitz and Monica Snyder for their extraordinary leadership and dedication at their 15th Annual Young Leadership Celebration. Get your tickets now for a night full of dancing, socializing, raffles, and silent auctions on Saturday, December 16 at The Colonnade Boston Hotel. Join hundreds of young adults on Sunday, December 17 at YJP Boston's Fire and Ice Chanukah Party. Pop open the champagne, mingle over cocktails, and enjoy latkes and donuts galore. There's even a special ice menorah lighting! You won't want to miss this—get your tickets now! We had such a great time at the Jewish Arts Collaborative alternative Shabbat experience on Saturday, November 4. 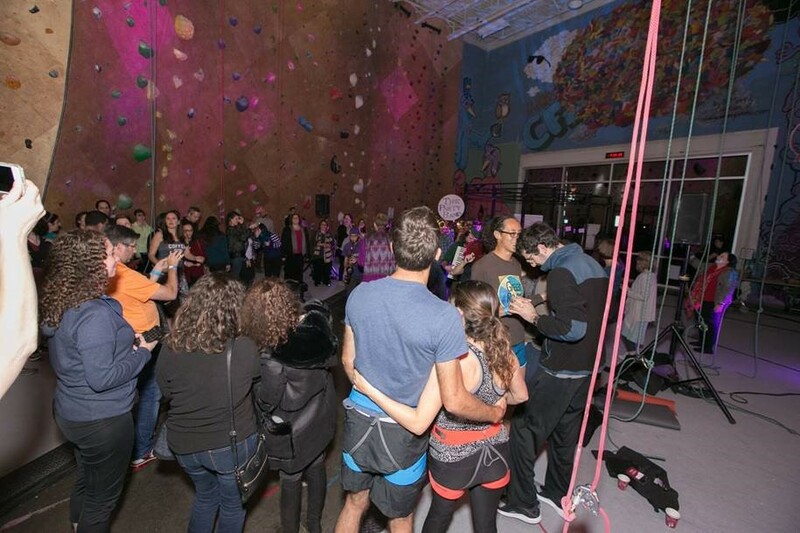 Whether you were there or not, check out Laura Mandel's fantastic reflection on the event! How much do you remember about the Hanukkah story? Watch as our friends over at JewishBoston try to tell us what really happened! They've also got amazing recipes, hilarious lists, and thoughtful reflections to help you celebrate the Festival of Lights – don't forget that Hanukkah starts at sundown on Tuesday, December 12! And here's when to bring the light of Shabbat into your Friday night – the earliest times all year! December 1 | 3:54 p.m.
December 8 | 3:53 p.m.
December 15 | 3:54 p.m.
December 22 | 3:57 p.m.
December 29 | 4:02 p.m.